Marcus Law eased his players back into pre-season training last weekend as the countdown to the new Evo-Stik Southern League Premier Division season began for Kettering Town. Law and his squad reconvened at Latimer Park as they start their preparations for the next campaign, which is due to start on August 6 with the fixtures set to be released on Friday, July 15. The Poppies boss decided to bring his squad back earlier than normal, given the early start date for the season while their first pre-season action will see them travel to Rothwell Corinthians on Tuesday, July 12. With the players now back in training, news of those who have been retained as well as potential new signings is now expected to increase over the next week. And Law said: “It was a nice, easy session to get things started. “We are mindful that some players are still taking their holidays while others still have those to come but we know where we stand with all of that. “The players seem to have looked after themselves over the summer, which is good and the preparations are now under way. “We have come back a bit earlier than normal but the start of the season seems to get earlier every week. “I normally like to have 12 sessions in the boys by the time they play their first friendly but, even with the early start, we will have only done nine before our first game. The Poppies, meanwhile, have confirmed they will compete for the Newlands Shield, donated by the Newlands Shopping Centre, over two pre-season friendlies with Rugby Town, who are now managed by former Kettering midfielder James Jepson. 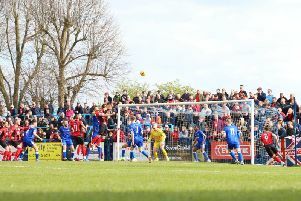 Rugby will visit Latimer Park for the first leg on Saturday, July 30 and that is followed three days later by the return match, which had already been part of the Poppies’ pre-season schedule. The winner will be decided on the aggregate score over the two games and there will be a penalty shoot-out following the second game at Rugby should the scores be level after 180 minutes. Tuesday, July 12: Rothwell Corinthians (a, 7.45pm), Saturday, July 16: AFC Kempston Rovers (a, 3pm), Tuesday, July 19: Wellingborough Town (a, 7.45pm), Saturday, July 23: Poppy-Mai Charity Team (h, 3pm), Saturday, July 30: Rugby Town (h, Newlands Shield first leg, 3pm), Tuesday, August 2: Rugby Town (a, Newlands Shield second leg, 7.45pm).